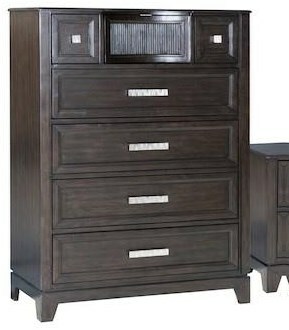 The Contemporary Designed Malta Bedroom Collection features a beautiful storage bed, finished in a warm Tobacco color! The group also features crisp clean lines, ball bearing drawer glides and is constructed using Poplar & Rubberwood solids and Birch Veneers! The Malta Chest by Najarian at Furniture Fair - North Carolina in the Jacksonville, Greenville, Goldsboro, New Bern, Rocky Mount, Wilmington NC area. Product availability may vary. Contact us for the most current availability on this product. The Malta collection is a great option if you are looking for furniture in the Jacksonville, Greenville, Goldsboro, New Bern, Rocky Mount, Wilmington NC area. Browse other items in the Malta collection from Furniture Fair - North Carolina in the Jacksonville, Greenville, Goldsboro, New Bern, Rocky Mount, Wilmington NC area.